I have decided to challenge again with my friend and “Seeing Eye Doug”, Doug Smith, and his boat Dream Weaver in February 2019. But, I am not doing this just for myself, but to raise awareness and support of the following charities: The Himalayan Cataract Foundation, Trachoma Control Program, Challenged Athletes Foundation, and Safecast. Below are the details of our project and my story of becoming totally blind at 16 years old and escaping depression and suicidal thoughts to being an inspirational speaker and athlete. Should I receive any funds in excess of what I need for the above, I will donate it pro rata to the charities. 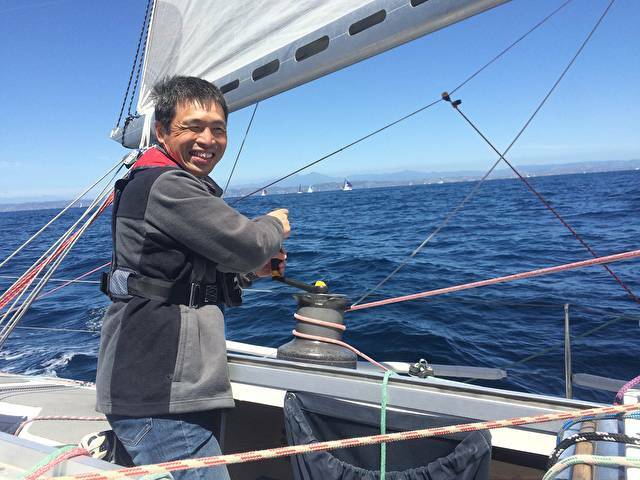 PROJECT: A team composed of a blind, but experienced, sailor (Hiro) and a novice sailor (Doug) to sail non-stop from San Diego to Fukushima Japan, each compensating for the other’s weaknesses and working together as a team to achieve the goal- “Blind Sailor and his Seeing Eye Doug”. San Diego is Hiro’s adopted hometown and Fukushima is where his last attempt, which was literally sunk by a whale, began. The trip is expected to take approximately sixty (60) days. PURPOSE: Raise awareness of the following: preventable and curable blindness; self-empowerment of those facing challenges; and citizen science (the team will be monitoring radiation and pollution levels during the voyage using a monitor provided by SAFECAST). 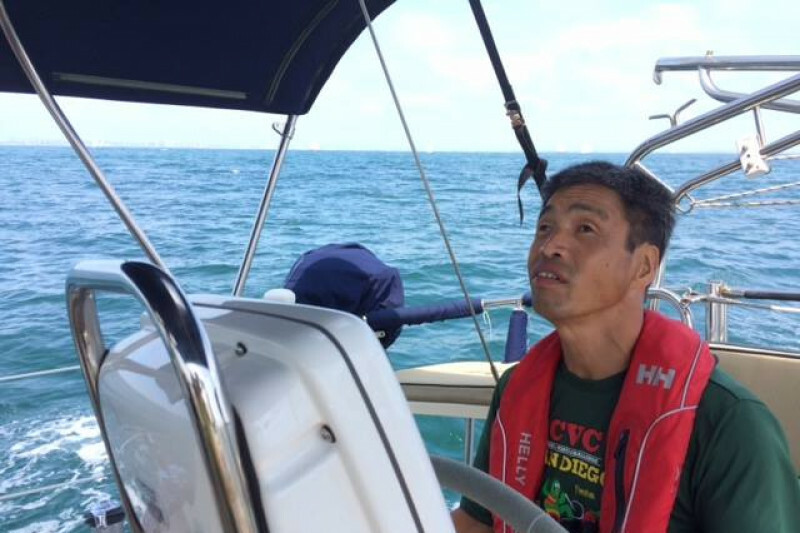 We also wish to realize Hiro’s quest of being the first blind sailor to make this voyage. Hiro Iwamoto- Mitsuhiro “Hiro” Iwamoto is a blind sailor who endeavors to cross the Pacific Ocean from San Diego, where he lives, to Japan, where he was born. 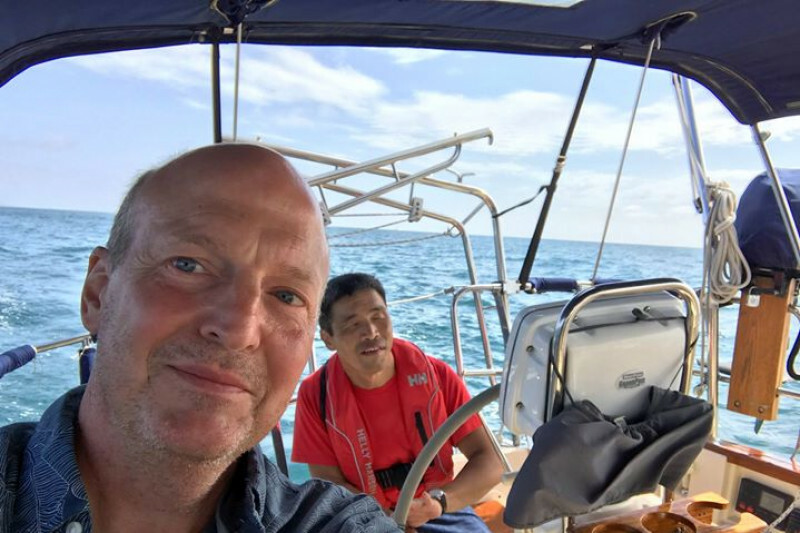 His first attempted to cross from Japan to San Diego in 2013 was scuttled when his boat struck a whale approximately 600 nautical miles of the coast of Japan (details below fin “About Us” following link ). Hiro became fully blind at the age of 16. His condition is total blindness- the complete lack of any visual light perception. After battling depression and contemplating suicide, Hiro found meaning for himself in helping and inspiring others. Hiro never gives up and is always ready for a challenge. He is a member of the Blind Stokers tandem bicycling club of San Diego and recently completed the IRONMAN competition in Arizona. Doug Smith- Doug Smith moved to Japan from the United States in 1990 where he started a career in real estate, met his wife, Naomi, and made a new life, including having two daughters, Rachael and Hana. Feeling fortunate for the opportunities he has had, he is looking for ways to help others and to support causes he cares about. Doug has always had an adventurous streak, among other things: completing the Chesapeake Bay Swim, white water rafting across Japan and bicycling 500 kilometers down the Old Tokaido Road connecting Tokyo and Kyoto. BOAT: “Dream Weaver”, a 40-foot Island Packet berthed in San Diego. The name “Dream Weaver” derives from a couple of strands of thought. First, the interconnectedness of life- each interaction/event/challenge, while shared, is simultaneously a separate thread in the stories of the lives of all those involved. Second, an acknowledgement that in sailing, as in life, there is no straight line to the goal. Rather, we set off pursuing a dream and weave- “tack” in sailing terms - to our destination. ORGANIZATIONS WE WANT TO HELP: The Himalayan Cataract Foundation , Trachoma Control Program , Challenged Athletes Foundation, and Safecast. Doug Smith will match, up to $2,500 for each charity (a total of $10,000), any properly evidenced donations to these organizations to promote awareness and support them. Details fo these causes are found below. I was born in Kumamoto, Japan, and during elementary school, like many other boys I wanted to be a professional baseball player. So I would always play baseball with my friends after school. Then when I was 13 I realized I was losing my sight for the first time as I was playing baseball with my friends. I could not catch the ball because I could not see it. Everyone in my team started blaming me when we lost a game. But even in that kind of situation, I could not tell them that I couldn’t see. I did not want them to know that I was losing my sight. After a while, I started bumping into things as I was walking. My parents took me to every eye doctor they can think of, but none of the doctors could figure out the cause of my blindness. This meant that there was no treatment, no cure for my sight loss. I was so scared, and I felt hopeless when I thought about my future. I wondered how my future was going to be. When I could not even put toothpaste on my toothbrush, I did not want to deal with my blindness anymore. I did not want to go on living asking for help all the time. On Aug. 13th, 1982, it was a very hot day, the sun was shining, and a lot of cicadas were making sound, as I headed to a bridge in my hometown of Ushibuka to commit suicide, to terminate my life. When I got there, I took off my shoes and put both my hands and right foot on the rail, but could not pull myself up over the rail, I tried again and again, but could not go over the rail. It's not that I didn't have enough strength to jump, but it felt like some unknown force was preventing me from jumping. After struggling for a while, I got so tired since I could not sleep at all the night before. I decided to take a nap on a bench in a park nearby. My uncle loved me so much as he would have adopted me if he didn’t have cancer. I gave up jumping off from the bridge and went back to my house. I returned to find that things were still the same, I still spilled toothpaste on my hand, spilled Miso soup on my lap, hit my head on the corner of my desk, etc. However, even in my daily struggles, I never thought about suicide again, because the message from my uncle was kept in a small part of my brain, and telling me that there is a meaning for all of this. Slowly but surely, I started to gain confidence and courage. After I became totally blind at 16, I wanted to find a sport in which I could compete equally with the sighted, so I began Judo. The first training I had to do was to lay on my back on the tatami mat and hit the mat with my arms (this was to train my reflex after being thrown by an opponent). I had to do this same training for a couple months and I started become bored and almost quit. But this experience taught me the importance of Kata, or form/discipline, in sports. And there was an incident where my Judo training helped my a great deal. In my early twenties, I was in San Francisco studying special education at San Francisco State. One day I was walking in downtown SF near Poway Station, and a pickpocket took my wallet and started running. Thanks to my Judo training, I was able to instinctively grab his shirt and do a Osotogari (threw him down on the ground), and handed him over to the police who happened to be near. For your own safety, you should not try to rob a blind guy. After returning from San Francisco State, I didn't want to lose my English so I began attending an English class. My English teacher introduced me to her friend Karen, who would become my wife. She and I would go hiking along with classmates and the teacher from the English class and we grew closer as we got to know each other more. We eventually began dating and got married on May of 1996. Sorry, I am a traditional Japanese male so I don't remember much of the details...I hope my wife is not reading this. After getting married, we lived Chiba prefecture, and there was a yacht harbor close to our home called Inage yacht harbor. On our evening walk we found a rental yacht shop. Karen was already an experienced sailor as she had been competing in races from middle to high school. Although I had no prior sailing experience, we decided to rent a yacht and give it a shot together. This was how I started sailing. In 2005 our daughter Leena was born, and my wife and I began to discuss whether staying in Japan or moving to the States would be the best for our daughter. After we weighed the advantages and disadvantages of the two countries, we decided that that it was best for our daughter to move to the States. So in 2006 we moved to San Diego. As a blind sailor, I began dreaming of sailing across the Pacific, the biggest ocean in the world, sailing from Japan to America with one other sighted person. I started sharing about my dream and passion everywhere I go, and that helped lead me to the right people and eventually I was sponsored. Mr. Shinbo who is a newscaster for Yomiuri TV in Japan offered to be my sailing partner for my challenge, and Yomiuri TV company and other companies became our sponsors. I didn't expect that my dream will come true so quickly. About three thousand people including many Tsunami survivors came to the port to cheer us up, and a Japanese Olympic female marathon runner, Kyu-chan (Naoko Takahashi), who won gold in the Sydney Olympics, came as a guest and we received her handmade bento lunch, etc. I was so happy, I had never felt as excited in my life as I was that moment when we left the port of Onahama in Fukushima. It was my idea to leave from Onahama port in Fukushima because I wanted to encourage the people there and be encouraged by them. We asked the people living there to write a letter to their family members and friends whose lives were lost in the Tsunami, and we planned to read the letters before putting them into the ocean. I was hoping that writing a letter would help them release their hardship, stress, and recover from their grief. On the sixth day around 7:20 in the morning, I heard something bumping on our boat three times, boom, boom, boom, Mr. Shinbo asked if those were waves hitting our boat, and I answered I don't think so. When I heard the sound and felt the boat shake, I thought we had a collision with a whale. I took two gallons of water from the bottom and the emergency bag which contained a satellite phone, GPS and a VHF radio. Our team made a distress call to the Japanese Coast Guard. We then abandoned our boat and went overboard on our life raft amid 15 foot waves and 30 knot winds. At the time of the collision, we were already 700 miles out in the ocean and there was also a typhoon heading over our direction. Since the Coast Guard couldn't get to us in time to rescue us from the storm and we were out of range of a helicopter, they dispatched the Japan Maritime Self-Defense Force (JMSDF). The JMSDF sent out a US-2 rescue aircraft (ShinMaywa US-2), but the first US-2 could not make a landing because of the high waves (the maximum height of waves it could land on is 10ft) and they were running out of fuel so after they circled over us trying to make a landing, they had to retreat. We felt hopeless and terrified when that first aircraft faded into the distance. Then 3 hours later, a second US-2 came. The pilot risked a dangerous landing to save us, and we were rescued after being stranded for 11 hours in the middle of the ocean. A press conference was held right after we were rescued and we arrived at Atsugi base, and a reporter asked me what I thought our boat bumped into. I believe I received a sixth sense in exchange for my sight loss and by that I knew it was a whale that hit our boat. Later we had experts confirm through the video left on one of our onboard cameras (we took out the SD card before we abandoned ship) that it was indeed a blue whale, approximately 50 foot big. Six days before this incident when we sailed out from Fukushima, I was at the highest point of my life, but within seconds I went straight down to a low point, in front of about 100 media people. I heard people say and was even told directly that it was a stupid plan for a totally blind person to try to sail across the Pacific. For a while I couldn’t see the purpose for this collision but before long I realized that this setback will make my future success 100 times even 1000 times bigger. The more I thought about these facts, the more I was thankful for just being alive. I also took the meaning of this event this way, God gave me a challenge to see if I could recover from this frightful experience, similar to what the Tsunami victims experienced. Ever since I found the meaning of the collision, I have been thankful for what happened.